All transactions are safe and secure with a reliable history in online purchasing behind each of our associates. 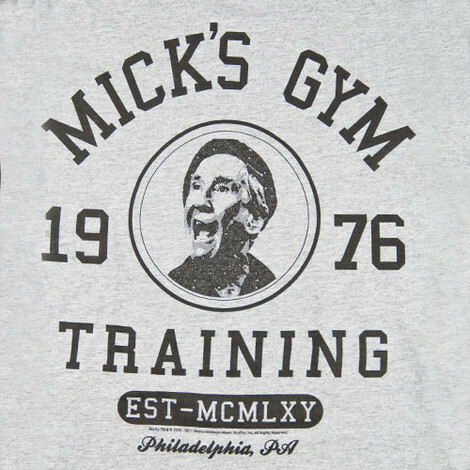 Buy the Rocky Mick's Gym t-shirt to own Rocky clothing and merchandise. Celebrate the champ with this Rocky Philadelphia tee that displays an image of Mickey surrounded by the name of his gym. Balboa (Sylvester Stallone) trains there, in addition to running the steps of the Philadelphia Museum of Art. One of our bestselling Rocky t-shirts, this tee will inspire you to reach for your dreams. In addition to the Rocky Mick's Gym tee above, browse the Rocky Clothing Gallery for more apparel like men's and women's clothes, kids shirts or hoodies.